HA-JDBC is a JDBC proxy that enables a Java application to transparently access a cluster of identical databases through the JDBC API. The database cluster is available to service requests so long as at least one database node is active. Because HA-JDBC operates via the JDBC API, it is transaction-aware and can survive a database node failure without failing or corrupting current transactions. By balancing read requests across databases, HA-JDBC can meet increasing load by scaling horizontally (i.e. adding database nodes). Optional dependency JARs can be downloaded from the Dependencies page. HA-JDBC is typically configured via XML file. The full schema definitions for past and present versions of HA-JDBC are enumerated on the XML Schemas page. A config property passed to DriverManager.getConnection(String, Properties), or the config property of the DataSource, ConnectionPoolDataSource, or XADataSource. Format the parameterized resource name using the identifier of the cluster. Uniquely identifies this database within the cluster. The class name of the DataSource implementation (from which a new instance will be created). The JNDI name of the pre-bound DataSource. Defines the relative weight of this database node. If undefined, weight is assumed to be 1. See Balancer section for details. The user name used by HA-JDBC to connect to the database for synchronization and meta-data caching purposes. This user should have administrative privileges. This differs from the database user used by your application (which likely has CRUD or read-only permissions). The password for the above database user. class name, then these properties are interpreted as JavaBean properties used to initialize the DataSource instance. e.g. JNDI name, then these properties are used as JNDI environment properties when constructing the initial context. e.g. When executing a read request from the cluster, HA-JDBC uses the configured balancer strategy to determine which database should service the request. Each database can define a weight to affect how it is prioritized by the balancer. If no weight is specified for a given database, it is assumed to be 1. N.B. In general, a node with a weight of 0 will never service a request unless it is the last node in the cluster. Requests are always sent to the node with the highest weight. Requests are sent to a random node. Node weights affect the probability that a given node will be chosen. The probability that a node will be chosen = weight / total-weight. Requests are sent to each node in succession. A node of weight n will receive n requests before the balancer moves on to the next node. Requests are sent to the node with the smallest load. Node weights affect the calculated load of a given node. The load of a node = concurrent-requests / weight. Defines a strategy for synchronizing a database before activation. A cluster may define multiple synchronization strategies, however, one of them must be designated as the default-sync. The default synchronization strategy is used when synchronization is triggered by auto-activation. The others are only used during manual database activation. HA-JDBC supports the following strategies by default. As of version 3.0, synchronization strategies are defined by identifier alone, not by class name. If the strategy exposes any JavaBean properties, these can be overridden via nested property elements. Does nothing. Use this strategy for read-only clusters, or if you know for a fact that the target database is already in sync. Performs a native dump/restore from the source to the target database. To use this strategy, the dialect in use must support it (see Dialect.getDumpRestoreSupport()). Unlike the other sync strategies, this strategy can synchronize both the schema and data. Truncates each table in the target database and inserts data from the source database. fetchSize 0 Controls the maximum number of rows to fetch from the source database at a time. maxBatchSize 100 Controls the maximum number of insert/update/delete statements to execute within a batch. versionPattern Specifies a regular expression matching the column name of a last update timestamp (i.e. version) column. If specified, a version comparison column can be used to determine whether a given row requires updating, instead of a full column scan. The state manager component is responsible for storing the active status of each database in the cluster, as well as any durability state. During startup, HA-JDBC fetches its initial cluster state is fetched either from another server, if HA-JDBC is configured to be distributable, or if the configured state manager is persistent. If no state is found, all accessible databases are presumed to be active. To ignore (i.e. clear) the locally persisted cluster state at startup, start HA-JDBC using the ha-jdbc.state.clear=true system property. A non-persistent state manager that stores cluster state in memory. A persistent state manager that uses an embedded database. This provider supports the following properties, in addition to properties to manipulate connection pooling behavior. The complete list of pooling properties and their default values are available in the Apache Commons Pool documentation documentation. user Authentication user name for the embedded database. password Authentication password for the above user. A persistent state manager that uses a BerkeleyDB database. This provider supports the following properties, in addition to properties to manipulate connection pooling behavior. The complete list of pooling properties and their default values are available in the Apache Commons Pool documentation documentation..
A persistent state manager that uses a SQLite database. This provider supports the following properties, in addition to properties to manipulate connection pooling behavior. The complete list of pooling properties and their default values are available in the Apache Commons Pool documentation documentation. No invocations are tracked. This durability level can neither detect nor recover from mid-commit crashes. This level offers the best performance, but offers no protection from crashes. Read-only database clusters should use this level. Tracks cluster invocations only, but not per-database invokers. This durability level can detect, but not recover from, mid-commit crashes. Upon recovery, if any cluster invocations still exist in the log, all slave database will be deactivated and must be reactivated manually. This level offers a compromise between performance and resiliency. Tracks cluster invocations as well as per-database invokers. This durability level can both detect and recover from mid-commit crashes. Upon recovery, if any cluster invocations still exist in the log, only those slave database on which a given transaction did not complete will be deactivated. While this level is the slowest, it ensures the highest level of resiliency from crashes. Name of a system resource containing the JGroups XML configuration. URL of the JGroups XML configuration file. Path of the JGroups XML configuration on the local file system. Legacy protocol stack property string. See the JGroups wiki for assistance with customizing the protocol stack. timeout 60000 Indicates the number of milliseconds allowed for JGroups operations. Meta data is loaded when requested and not cached. Meta data is loaded and cached per database as it is requested. Meta data is loaded and cached as it is requested. All necessary meta data is loaded and cached per database during HA-JDBC initialization. All necessary meta data is loaded and cached during HA-JDBC initialization. Since HA-JDBC’s configuration file contains references to database passwords, some users may want to obfuscate these. To indicate that a password uses an obfuscation mechanism, use a “:” to indicate the appropriate decoder. Decodes passwords using hexidecimal decoding. Decodes passwords using Base64 decoding. Most applications that write information to a database require some kind of primary key generation mechanism. Databases typically provide 2 mechanisms for doing this, both of which are supported by HA-JDBC (if the configured dialect supports it): database sequences and identity (i.e. auto-incrementing) columns. It is important to note the performance implications when using sequences and/or identity columns in conjunction with HA-JDBC. Both algorithms introduce per statement regular expression matching and mutex costs in HA-JDBC, the latter being particularly costly for distributed environments. Because of their performance impact, support for both sequences and identity columns can be disabled via the detect-sequences and detect-identity-columns cluster attributes, respectively. Fortunately, the performance penalty for sequences can be mitigated via what Hibernate calls a Sequence-HiLo algorithm. For best performance, HA-JDBC recommends using a table-based high-low or UUID algorithm so that statement parsing and locking costs can be avoided. Object-relation mapping (ORM) frameworks (e.g. Hibernate, OpenJPA, etc.) typically include implementations of these mechanisms. Create an implementation of the custom component. All extension points implement a getId() method which indicates the identifier by which this instance will be referenced in the configuration file. Create a META-INF/services/interface-name file containing the fully qualified class name of the custom implementation. Reference your custom component by identifier in your ha-jdbc xml file. As of version 3.0, an HA-JDBC cluster can be configured programmatically. // Database cluster is now ready to be used! Application access an HA-JDBC cluster either via the Driver or DataSource. To access a specific cluster via the Driver, HA-JDBC must be configured to access your databases accordingly. 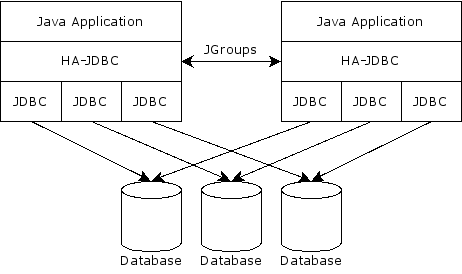 To access a specific cluster via a DataSource, HA-JDBC must be configured to access your databases via DataSources. HA-JDBC provides a DataSource, ConnectionPoolDataSource, and XADataSource implementations, depending on which resource you plan to proxy. Obtain the next database from the balancer. Execute the statement against this database. If the statement execution succeeded, return the result to the caller. If the statement execution failed, we analyze the caught exception. Repeat using the next available database. If the exception is determined not to be a failure, the exception is thrown back to the caller. Alternatively, database writes can be configured to execute against both the master and backup databases concurrently. While this will result in better performance, it will cause deadlocking if multiple application threads attempt to update the same database row. If your use case is compatible with this limitation, you can enable parallel writes via the transaction-mode attribute. Execute the statement against the master database. Repeat using a new master. Otherwise, if the statement execute succeeded or the exception was not determined to be a failure. Execute the statement against the backup databases in parallel. Compare the result from the master database against the results from the backup databases. If the result from a backup database does not match the result from the master database, deactivate that backup database. The exception is determined to be a failure if the exception is an instance of java.sql.SQLNonTransientConnectionException. The exception is determined to be a failure if the error code of the exception is XAException.XAER_RMFAIL. Any dialect can override this behavior, perhaps by inspecting vendor codes, SQL states, etc. Remove the database from the set of active databases. Persist the new cluster state via the Cluster State Manager. If the database cluster is distributable, broadcast the database deactivation to other servers. Databases can also be deactivated manually via JMX. You can optionally configure HA-JDBC to proactively detect database failures via the failure-detect-schedule attribute. The value of this attribute defines a cron expression, which specifies the schedule a database cluster will detect failed databases and deactivate them. Test that the target database is indeed alive. Acquire a lock that blocks all clients from writing to the database cluster. Synchronize the target database with the master database using a given synchronization strategy. Add the target database to the set of active databases. If the database cluster is distributable, broadcast the database activation to other servers. Release the lock acquired in step 2. In general, database synchronization is an intensive and intrusive task. To maintain database consistency, each database node in the cluster is read locked (i.e. writes are blocked) until synchronization completes. Since synchronization may take anywhere from seconds to hours (depending on the size of your database and synchronization strategy employed), if your database cluster is used in a high write volume environment, it is recommended that activation only be performed during off-peak hours. Alternatively, HA-JDBC can attempt to activate any inactive databases automatically via the auto-activate-schedule attribute. If specified, HA-JDBC will automatically attempt to activate database nodes that are inactive, but alive, according to the specified cron schedule. Indicates the unique identifier of this database cluster. Indicates whether or not this database cluster is active. Indicate the version of HA-JDBC in use. Enumerates the currently active databases in this database cluster. Enumerates the currently inactive databases in this database cluster. Indicates the default synchronization strategy for this database cluster. Enumerates the synchronization strategies available to this database cluster. Indicates whether the specified database is responsive and able to be activated. Activates the specified database using the default synchronization strategy. Activates the specified database using the specified synchronization strategy. Adds a new database to the cluster using the specified identifier. The database will remain inactive until fully specified and activated. To complete the database description use the net.sf.hajdbc:type=Database,cluster=cluster-id,database=database-id mbean. Removes the specified database from the cluster. Only inactive databases may be removed from the cluster. Flushed the internal cache of database meta data.